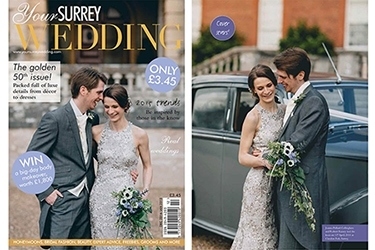 As featured in Your Surrey Wedding Magazine. I met Rob and Jo last June when they booked me to photograph their wedding. They also wanted an engagement shoot to help them get used to acting naturally in front of the camera and I was lucky enough to have this featured on the Blush Bride blog. I had been looking forward to their wedding for some time at the spectacular Palladian mansion in Clandon Park. This impressive venue sits at the foot of the Surrey hills and features beautiful landscaped gardens and magnificent interiors including the incredible Marble Hall. Renowned as one of Surrey’s most prestigious wedding venues, Clandon Park is one of my favourites and I’m looking forward to shooting at this venue again several times in 2015. Rob and Jo’s wedding day was nothing short of exquisite and the delighted couple were kind enough to write me a fantastic review. I really enjoyed the journey working with them from start to finish and wish them all the best for the future. Samantha - I cannot wait for you to capture our special day through your beautiful photography! !